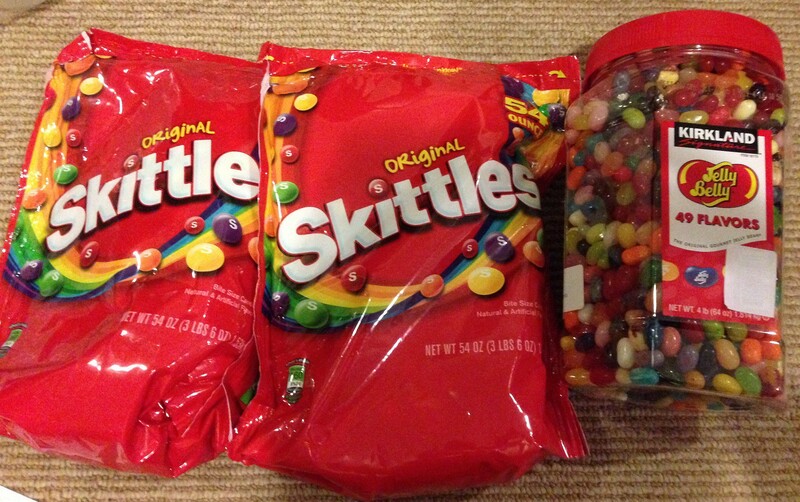 Recently, I was invited to a white elephant exchange. For those who haven’t done one, you bring a gift and it can be nice, weird, random junk, etc then everyone picks numbers and chooses a gift. Later numbers can steal from earlier numbers. I like bringing nice or weird gifts, rather than junk, and I wanted to make something. 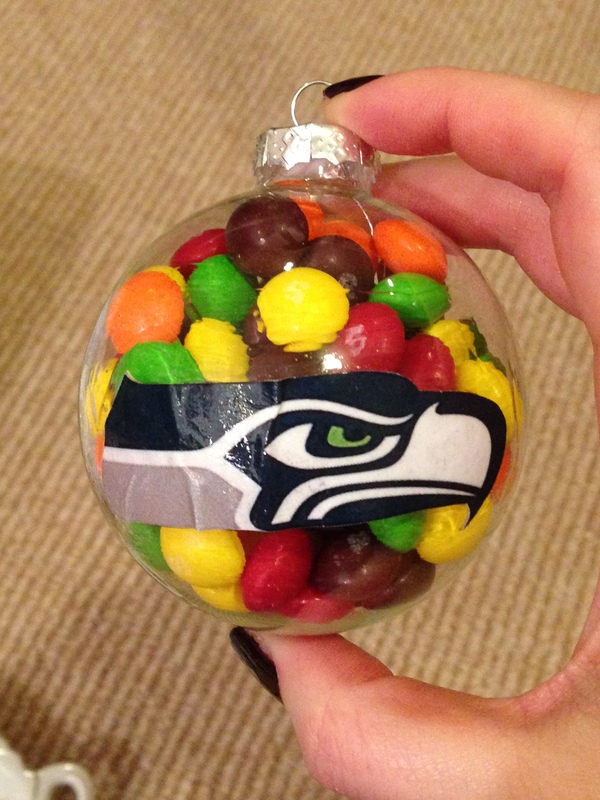 I knew that the participants were all big Seahawks fans so I started googling around for ornament tutorials. I found this wonderful YouTube tutorial that showed how to take a clear ornament and glue an image on the outside. It seemed easy enough, so I bought some supplies and made a test ornament. 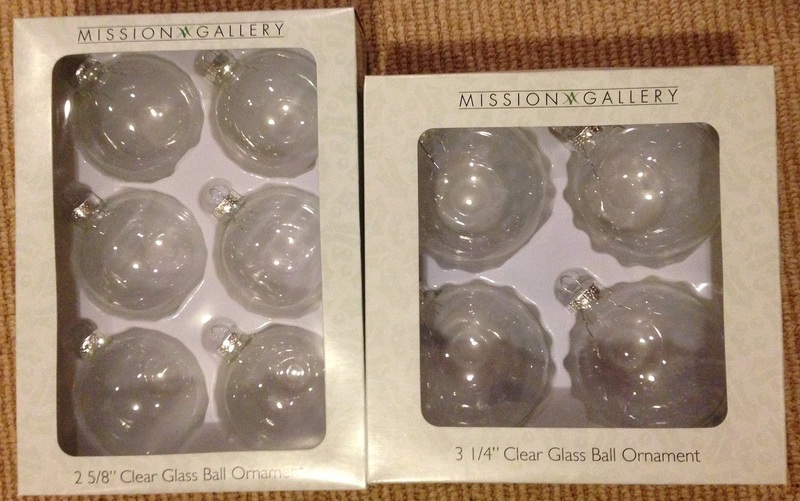 I bought clear glass balls in 2 sizes (2 5/8″ and 3 1/4″) as well as plastic ones (2 5/8″) that snap in half. I could see pros and cons for both types so I wanted to get both to play with. 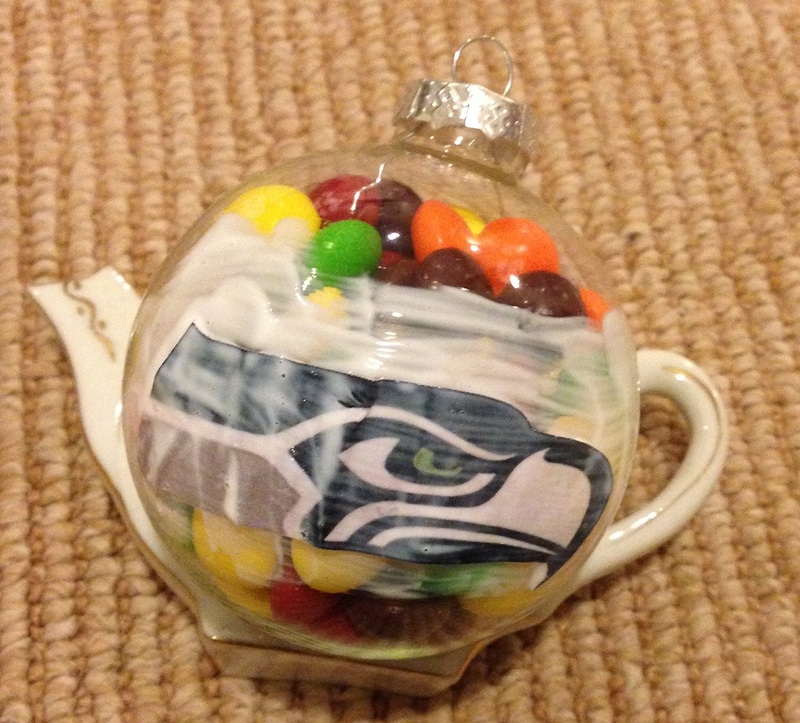 For my white elephant ornament, I used a glass 2 5/8″ ball. 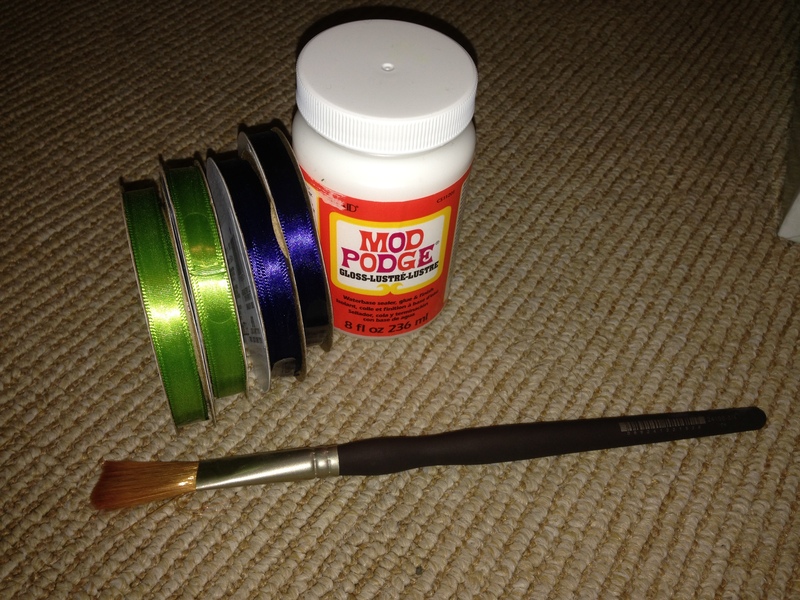 Additional supplies: Mod Podge glue, paint brush, and ribbon for the top of the ornaments. 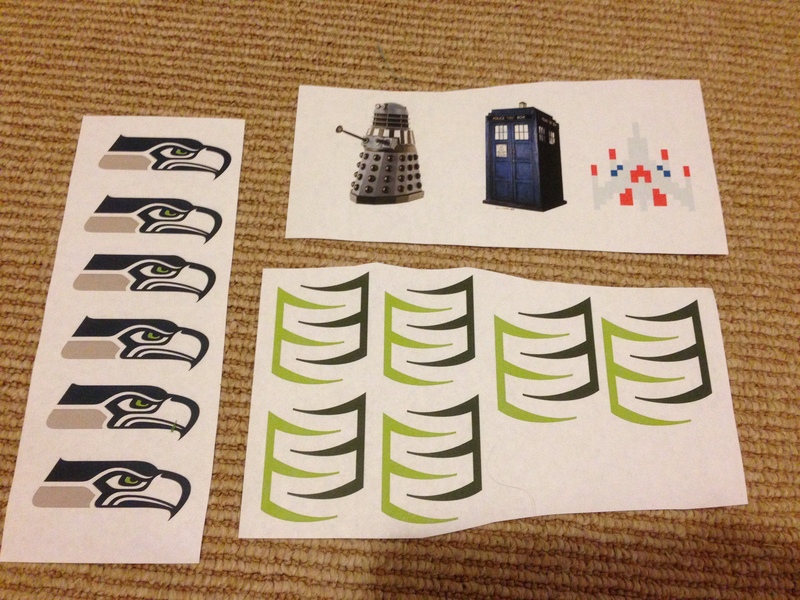 Step 1) Print out the decals that you are going to use. In the YouTube video, the gal uses an old Seahawks program. I didn’t have one of those lying around. 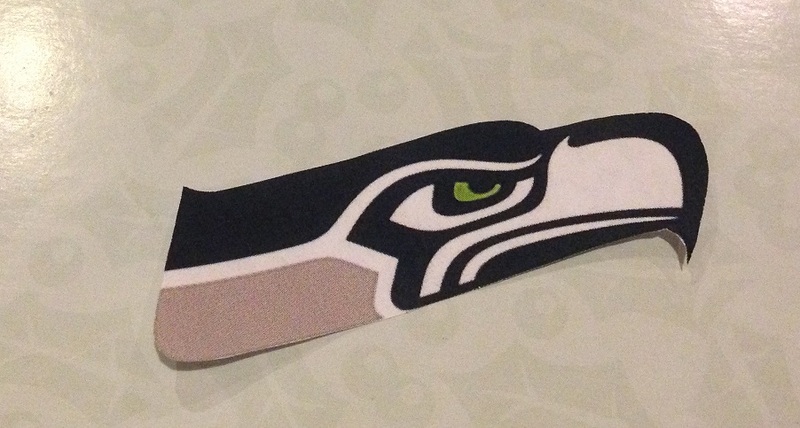 The left is the Seahawks logo. Then the top is the Dalek and Tardis from Doctor Who, the ship from the video game Galaga which my boss and I are fiercely competitive at (though I have the top 3 high scores right now… just saying), and then the bottom right is my office logo. 3) Take out the top of the ornament. Fill however far you want with whatever you want. 4) Using the paintbrush, brush a small ring at the top of the ornament and glue in the top piece. Then brush a light layer where you are going to glue the decal. 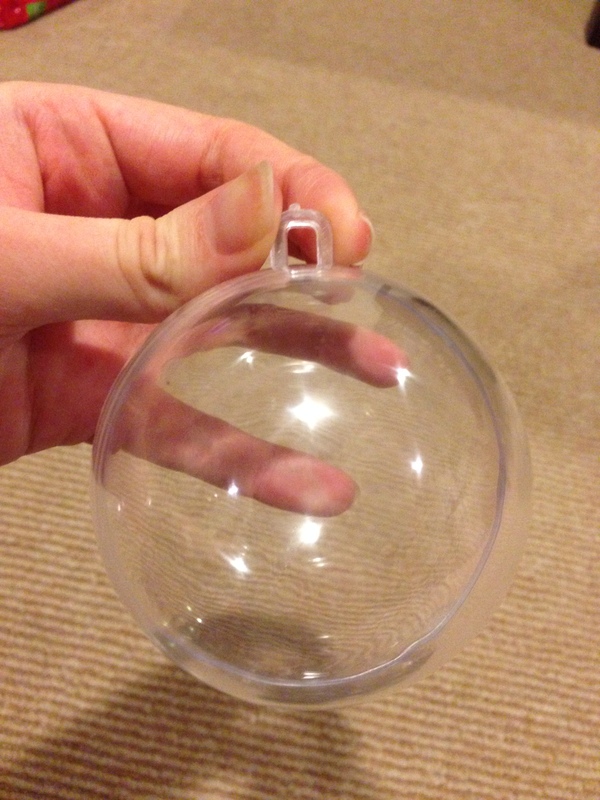 5) Lay the decal onto the ornament. Brush another layer of glue on top. *Important* Have an idea of where you’re going to set this to dry. Oops… I frantically grabbed my tea ball holder. 6) Let the ornament dry. 7) After it’s dry, tie the ribbons on the top to make it look nice and pretty. I forgot to get a picture of the final ornament before it went to its new home … next ones, I will make sure to get pictures. For my next batch, I plan to put the logos higher. I also had a few creases in the paper. But overall, I am thrilled with how it came out. Though I didn’t anticipate the lack of crafty people at the gift exchange and had to explain that you don’t crack it open Easter egg style to get the Skittles out. 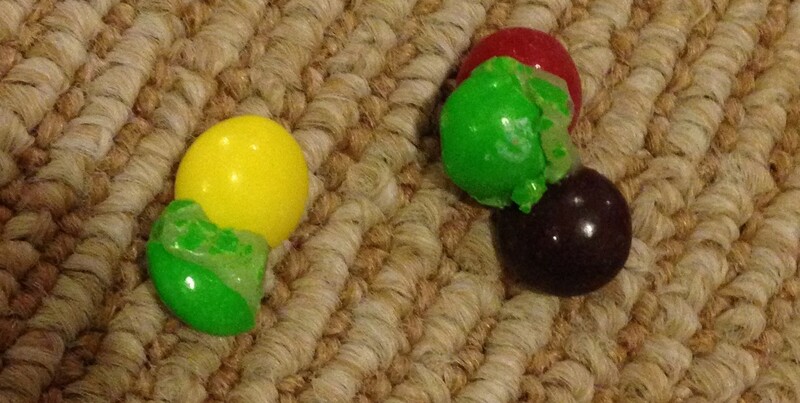 Or throw it at people as a Skittle/glass bomb. Luckily the gal who took it home understood what not to do.